For many people the idea of taking up, or playing more golf seems a suitable solution to the requirement to keep active, but is this really a good form of exercise and why might a casual player benefit from a golf biomechanics analysis? They’ll walk around the golf course, whack a ball around and get to enjoy the company of their playing compatriots. So, why might a better knowledge of how their body works, and how this relates to their golf be of interest? In the modern world we are constantly being told that we don’t move enough. The benefits of exercise are well documented in terms of reducing cardiovascular disease, certain types of cancer and recent research has even suggested regular exercise can help push back the onset of dementia. Quite apart from cardiovascular exercise (i.e. getting out of breath! ), there are other aspects of exercise that are also known to be beneficial such as working on balance, flexibility and muscle strength. NHS guidelines recommend a combination of both cardiovascular and strength exercise every week. Golf; that’s not exercise, IS IT? The seemingly relaxed pace of golf when compared to other sports belies its physical nature. It goes without saying that a typical game of golf can involve walking several miles, but there is much more to it than that. Consider that you are maximally rotating and coiling your spine, forcibly externally rotating your trailing arm and vigorously stretching your lead arm, bracing your thigh and hip muscles and that only gets you to the top of your backswing! You then must uncoil all of that stored up energy as fast as possible, whilst maintaining a stable view of the ball, keeping your balance and delivering the club back to the ball with the correct face angle and loft preferably at over 100mph in order to hit your desired drive. Shall we reconsider that view of golf not being a strenuous game? I say this not to perturb the enthusiastic and avid golfer, but because reconsidering your notion of the game may help you to play better, get more satisfying results and reduce your risk of getting injured. You may not be surprised to hear that 52% of male golfers and 48% of female golfers regularly experience lower back pain. Wrist, elbow, shoulder and neck injuries are also common amongst golfers. What if we were to understand why it is that we find certain positions in the golf swing difficult to consistently reproduce or downright uncomfortable? Ultimately we are all creatures of habit. We sit in certain ways; we stand and walk in characteristic postures; we often lift bags with the same hand and carry them on the same shoulder. Inevitably our muscles, connective tissues and even our joints adapt to these patterns of a lifetime. These areas tightness in the body will reduce our flexibility in certain planes of movement. For many people too much sitting shortens and stiffens their hip flexor (front hip) muscles, inhibits their gluteal (buttock) muscles and stiffens the joints of their mid back. These are the very areas of the body that we rely on to be most flexible when we swing the golf club. Common swing faults such as swaying off the ball, lifting of the arms, restricted shoulder turn (actually biomechanically it’s mid back turn) and loss of spine angle, are all common results of biomechanical restrictions in our body. Players can tirelessly work on their swing and have lessons to try to correct these swing faults rather than considering that, in fact, their body is moving the only way it can to the desired destination i.e. top of the backswing, impact with the ball or finish position. Some of these issues may represent structural issues that cannot be altered. However, in many cases some simple exercises can allow a player to move more freely and swing the club with better technique, greater speed and improved accuracy. The key is to be assessed so you can learn what your strengths are but also where you lack flexibility, balance, strength, or core muscle endurance. Once you are armed with the knowledge from such a golf biomechanics analysis, you have the knowledge to make yourself a better player. Who can benefit from a golf biomechanics analysis? There is a myth that only good players benefit from such an analysis of their golf biomechanics. Well no doubt, good players can benefit from a golf biomechanics assessment, and many top players make use of this service. However, good players already move well – that’s why their results on the course are the envy of many. The better players are looking for small alterations that give them a competitive edge to an already sharp and well-honed game. In fact, the players that often make the greatest improvements and biggest gains are the ones whose faults are more pronounced and whose bodies aren’t currently well adapted to swinging a golf club. So, it’s the mid and high handicappers that have the most to gain! In the end if you’re a golfer who’d like to improve, if you wish to reduce a few aches and pains, wouldn’t mind getting a bit trimmer or you would like to enjoy the well documented benefits of exercise you may just want to re-think how you approach the game of golf. Do a few exercises specifically tailored to your individual needs, spend five minutes warming up before you play, and who knows…… you might surprise yourself with your scores and maybe even take a few quid off your friends playing at the weekend. Chiropractor Stuart Robinson has worked from Haslemere Chiropractic Clinic since 2013. 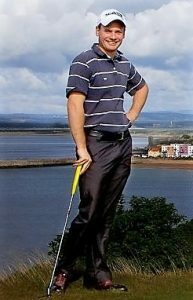 He is a keen golfer and plays off scratch at Walton Heath and St Andrews. This special interest in golf, combined with his chiropractic expertise, has lead Stuart to develop a golf biomechanics analysis system, and to give teaching seminars about golf biomechanics. Although Stuart works with a number of professional players, and was cited by Gary Orr this year as one of the factors behind his success on the Senior European Tour, he particularly enjoys working with amateurs with higher handicaps because they typically show the most dramatic improvements with his targeted exercise programme. “After my initial assessment, Stuart provided me with a simple programme that I could do at home. It has significantly increased my balance, flexibility and strength, resulting in me adding 20 yards to my drives and a reduction of 1.6 shots off my handicap in less than 10 weeks”.